Temperature Range - 150C - 300C. Cable armor compressive force prevents the core from snapping due to excessive movement. Single and multi-conductor configurations for deploying several gauges on one TEC line. Metal Cladding alloy options based on well conditions - 316L, I-825 and I-625. Pressure-TEC cabling systems add an extra layer of protection by enabling the weld to be verified through an internal pressure test, thus reducing the risk of premature cable failure resulting from a weld defect. 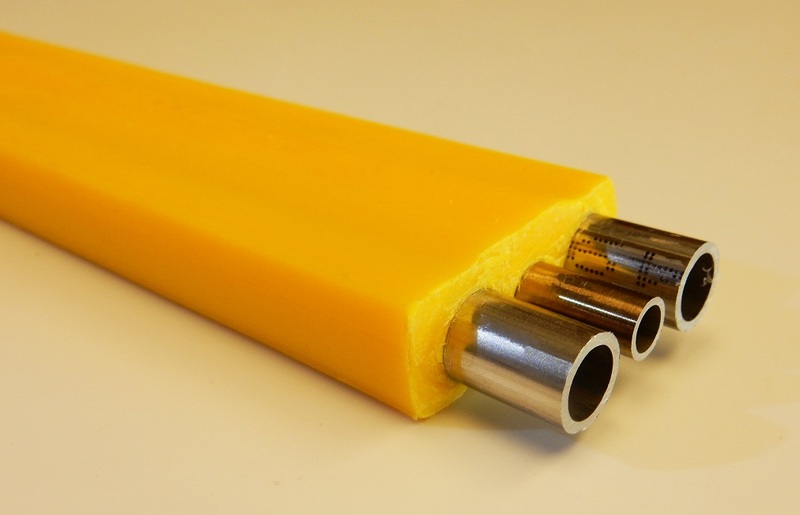 Next generation foamed cable designed to yield a centralized conductor with easier termination and automatic filler layer removal if required. Proprietary manufacturing process creates a superior bonding force between the armor tube and filler layer when compared to standard roll reduced constructions. Bonding assures that the core will not fall into the tube when terminated on the topside as well as pullout from the gauge. Full range of jacket encapsulations from 150C - 300C. Metal Cladding available in 316L, I-825, and I-625. Flat-TEC eliminates the need for multiple cables and can be used to perform operations using RSCC Standard-TEC, Pressure-TEC, and Digi-TEC products all in one cable. For moving hydraulic or other fluid in smart well, permanent down-hole cable (PDC) applications. Encapsulated with high performance thermoplastic or elastomer materials functional in either 150C or 200C operating temperature environments. The RSCC Downhole Products division will continue to work directly with its worldwide network of customers to design cable for use not only for today's oil reservoir monitoring and extraction processes, but also in the development of future technologies that will support energy discovery for decades to come.